What are the main goals of Jack's PACT? (2) To raise awareness in the community about the seriousness of drunk driving and encourage people of all ages to sign Jack's PACT, a serious pledge not to drive while under the influence of alcohol or drugs. (3) To advocate for changes in laws and make consequences more severe for OUI and vehicular homicide while under the influence of drugs or alcohol. With which organizations does the PACT currently collaborate? Falmouth Prevention Partnership/Gosnold Prevention Department, Falmouth Together We Can, Falmouth VIPS, Falmouth Public Schools, Falmouth Academy, Falmouth Recreation Department, Falmouth Soccer Club, various liquor stores, and the list continues to grow! Who may join Jack's PACT? Anyone! 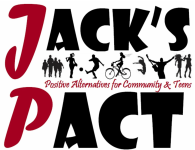 Interested teens, parents, coaches, teachers, and ALL who wish to help Jack’s PACT carry out its goals to prevent drunk driving. What does it mean to be a member of the PACT? What types of pro-social activities does the PACT support? Falmouth Recreation Center's After School Program and Youth Nights, Falmouth Prevention Partnership events, Project Sticker Shock, No Guff Week, Falmouth Soccer Club and other athletics, Powder Puff Football, Celebrations After Prom Party, Run Jack Run Family Fun Run/Walk, Study Abroad and Travel for students, Scholarships, etc.